There comes a time in every man’s life when he must make a statement. For a lot of us, it happens around the age of…well, forget that, it’ll happen when it happens. Most of us probably acquired at least one or two solid colored suits for our first job interview and subsequent hiring. The day will come, however, when you look in your closet and are no longer interested in simple black, blue and grey suiting options. When this need to be bold occurs, you’re better served to know how to handle things slowly or you’ll end up looking like Craig Sager (no shots at Craig Sager, I happen to think his style is fantastic). Bold suiting has range just like anything else within the world of menswear. There’s pattern, color and style to adhere to, so listen up and I’ll tell you how to come out looking like the man. First of all, be aware of the brands that offer bolder options. The suit I’m wearing is from Bar3, a label who sells through Macy’s. They’re great to consider because of affordability and quality. After all, you don’t want to spend thousands of dollars on a suit that you aren’t able to wear on a regular basis. Lots of other options are out there, just do your research. After you find a brand within your budget, be realistic about your own personal style and willingness to go bold. If you’re not an outgoing guy who’s ok with being the center of attention, you probably don’t want to do anything with extremely bright colors or patterns. This grey and black plaid suit is great for the guy who’s ok with being noticed but doesn’t need to scream for attention. It’s slim fit and stylish, allowing me to be comfortable in it and exude the confidence of feeling great. There are some rules you’ll want to follow when styling your bold suit. 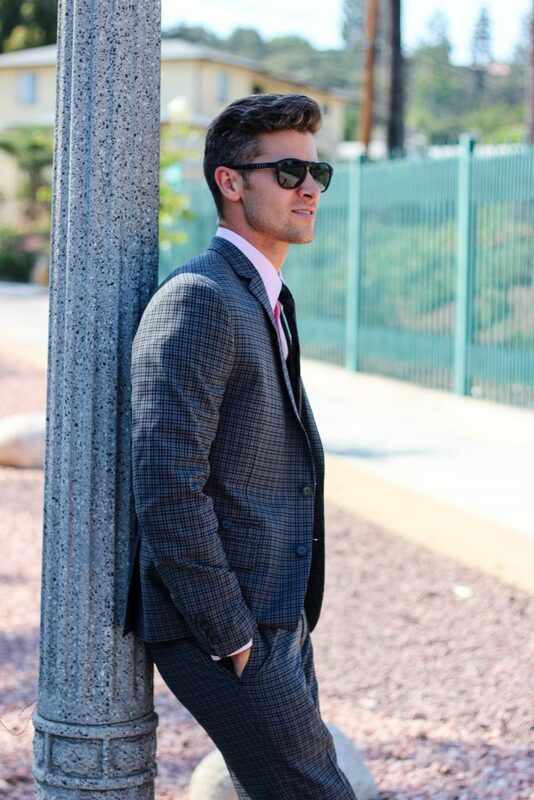 First, if the suit is dark like this one, contrast it with a pop of color in your shirt. This pink button up from Combat Gent is a great shade to differentiate from the gray and black (plus it’s only $35!). Next, I’d recommend a mostly solid colored tie so as to not conflict with the pattern of the suit. Although my tie is also plaid, it’s predominantly black so there are no distractions from the suit. The tie is also from Combat Gent. 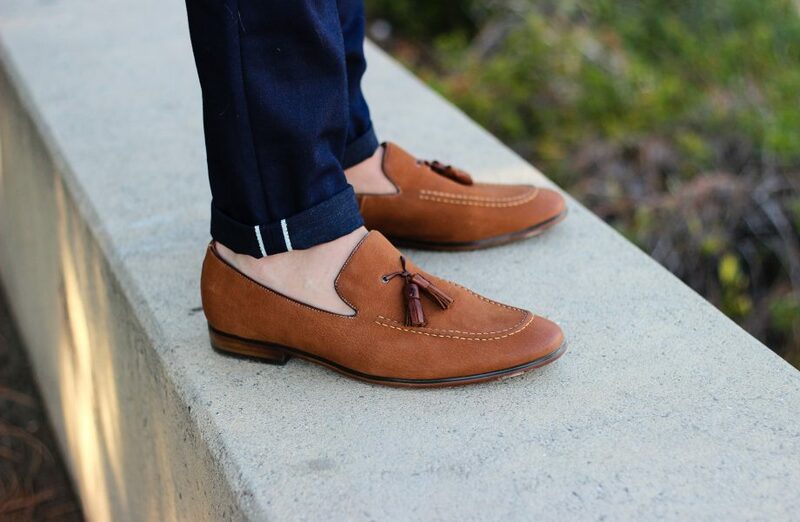 Shoes are a fun thing to pick when you’re wearing a bold suit because they can add to the look by making it even wilder, like these patent leather monk straps from Aldo. 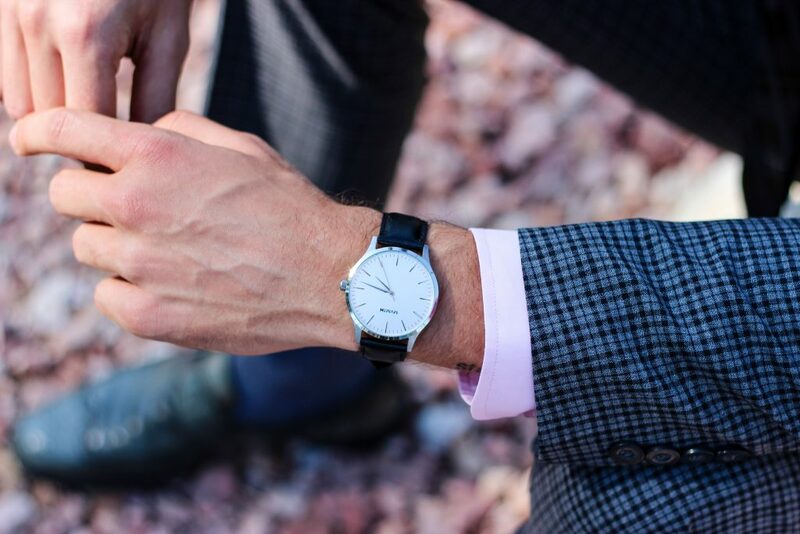 You can also go with something subdued and muted in color, therefore allowing the suit to do the majority of the work in terms of standing out. Whatever you do, be sure to keep things simple. By overdoing it with accessories like pocket squares, lapel pins, bracelets and rings, you’re going to start slipping into “pimp” territory and that’s not what anyone wants to see. The only thing I chose was my new watch from MVMT. Obviously you’ll want to be sure you’re not overstepping your boundaries thanks to the boldness of your attire. The best times to take this out of the closet are date nights, fancy nights out with your buddies, your own bachelor party and a work holiday party. It’d be a bad idea to wear a bold suit like this to an interview, your first day at work, a funeral, someone else’s wedding (or even your own…don’t upstage the bride, dude). What really matters is carrying yourself with confidence and letting the suit speak for you. It’s fun to be bold. Especially when it’s done right. Follow these steps and you’re gonna be looking great! Questions? Comments? Don’t be shy, find me on social media @parkeryorksmith or email me parker@thelooksmith.com.